By Laura. Posted August 1, 2011 at 12:28 am. In my last Sephora order, I tossed in one of the new polishes they have, Spark-Tacular! ($9.50/.5oz). I’m a sucker for multi-color glitters, and like Pokemon, I gotta catch em all. Spark-Tacular! has small and medium sized silver/green/blue/pink/orange glitter. Of course, I had to add comparisons with my other multi-color glitters, Deborah Lippmann Happy Birthday ($18/.5oz) and Milani Gems ($4-5/.45oz). As all of these are top coats, I did one coat of each over the manicure I was already wearing (dark gray NARS Galion, swatched here). 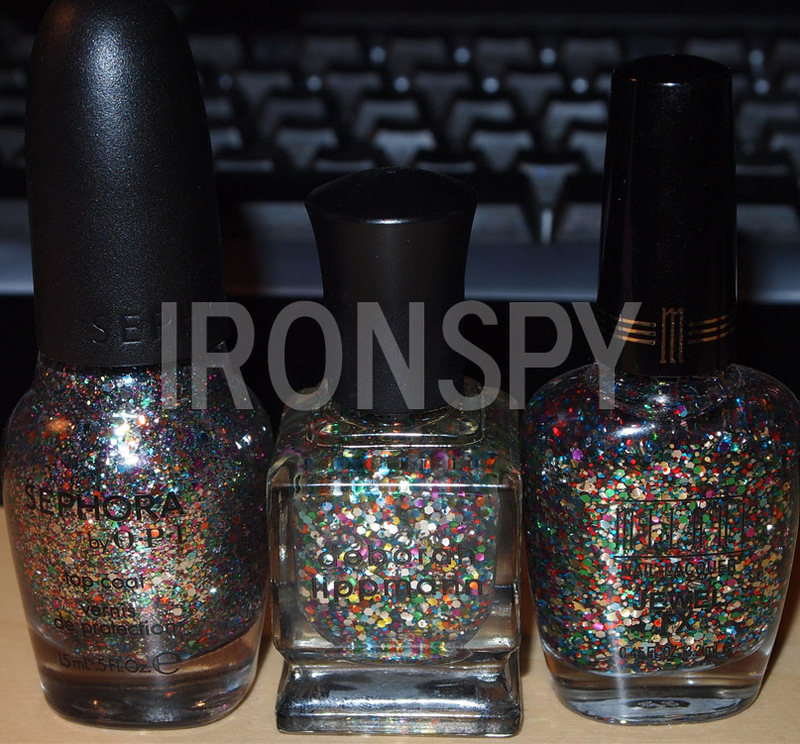 On to the swatches/comparisons, then I’ll talk a bit more on the differences between the three polishes. CLICK for full size!! Spark-Tacular!, Happy Birthday, Gems. CLICK for full size!! Spark-Tacular!, flash. CLICK for full size!! Spark-Tacular, indoor lighting. CLICK for full size!! Comparisons, indoor light. CLICK for full size!! Comparisons, flash. CLICK for full size!! Comparisons, indoor lighting again. As you can see, Spark-Tacular! has smaller and more dense circular glitter (it does have larger hex glitter as well but it’s more sparse than that in the other two), with more silver. Happy Birthday has larger hex glitter and medium size square glitter. Gems has medium and large hex glitter. Obviously, Spark-Tacular! is not a dupe of either of these. 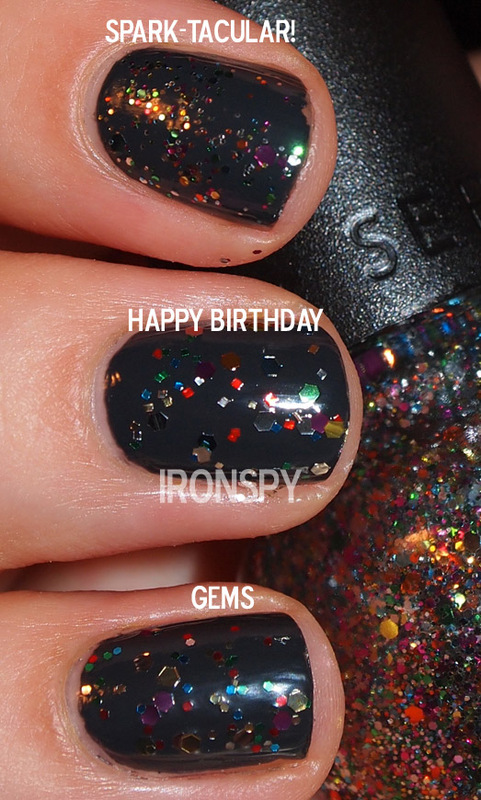 One can say that Gems and Happy Birthday are twins (fraternal twins that is, Gems has no square glitter), while Spark-Tacular! is only a first cousin. If you like Spark-Tacular! and you have either Gems or Happy Birthday, I wouldn’t think twice on ordering it as they are definitely different.